A new set of updates have been released which is good news as the previous versions had been removed for download. Get the details and links to downloads from here. As with all previous updates make sure you have installed the OCS2009-DBUpgrade otherwise you will hit problems. Make sure you stop all the OCS services and apply the updates using the ServerUpdateInstaller and the OCS2009-DBUpgrade before restarting the services to avoid any incompatibility issues. It does look like the DBUpgrade has not changed since the July update, they are both dated 1 July. Overall the patches basically fix the problem with RGS found in the July update and a problem with server with more more than 16 cores. No new client fixes released as yet. 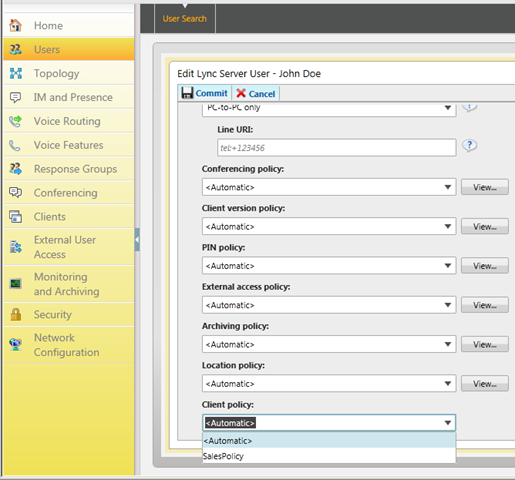 With the release of Lync Server 2010 (RC) the settings which were deployed using group policy for OCS 2007 R2 are now for the most part sent using in-band provisioning to the client. There are a few setting which are used for Client bootstrapping and therefore still need to be configured in Group Policy. Here we are creating a policy called SalesPolicy with 2 settings to turn off Emoticons and to turn off checking that the Outlook and Lync are running under the same account. 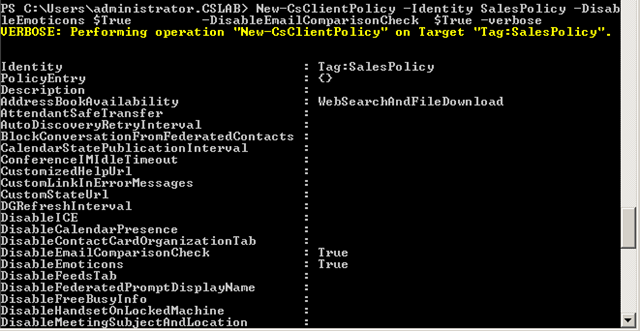 Here we are getting all the enabled users in AD who have a department of Sales and applying the policy to them. Microsoft Office Communications Server 2007 R2, Microsoft Unified Communications Managed API 2.0 Core Redist 64-bit installation requires Microsoft .NET Framework version 3.5. Installation cannot continue. Microsoft has put up a knowledge base article kb2224981 describing the issue and also the work around. Remove .NET Framework 4.0 from the server. By default OCS only installs the US English language pack for Response Groups. There are 11 other language packs you can install. The RGS uses the UCMA 2 Speech language packs which can either be found on the OCS install CD in the \Setup\amd64\Setup\Speech\ directory. You can also download the packs from here. After running the msi to install the language pack you need to register the language pack. To install the language packs you need to run the rgslang.exe application from the OCS 2007 R2 Resource Kit. From a cmd prompt run RGSlang sync then restart the RGS service. Full details of the install process can be found on TechNet. As well as the speech packs you can also manage OCS in different languages or display the OC Tab in a different language by downloading the Response Group Service Language Pack. The July updates have been released and can be downloaded from here. For details of what is included in the patches can be found here http://support.microsoft.com/?kbid=968802 along with installation details. A few people have mentioned issues with the latest update but this appears to be because the OCS2009 DBUpgrade hasn’t been applied. This needs to be applied separately for a good description of how to apply this patch there are a number of blog entries such as the one on msunified. I still find that customers are using self signed certificates for their Exchange servers. When you install Exchange UM and want to link it to OCS you need to use a properly trusted certificate from a CA. To do this requires some messing around in Powershell and can be inconvenient. Today I spotted a blog post from Rui Silva highlighting a Certificate Management Tool from U-BTech which gives a quick and easy GUI to manage the Exchange server certificates. I haven’t tried it yet but I think it is definitely worth investigating. Microsoft has produced some tremendous end user training materials for OCS. When implementing systems for customers you can give them this material knowing their users will then have access to the resources they need to be productive with Communicator etc from the start. Microsoft haven’t stopped there and they now have a training course for the help desk. The course is designed to help you in supporting Microsoft Office Communicator 2007 R2. You will learn some of the most common Office Communicator 2007 R2 support scenarios that might be encountered, as well as how to troubleshoot the issues and how to resolve them. The prerequisite for the Help Desk training includes the UC Tutorial which is also a good resource for users. The main material I recommend for an end users reference is the UC How To. This is a Silverlight application that provides step-by-step instructions for common UC tasks. You can customize the How-To application to your company’s needs based on the UC features you’ve installed. For example, if you have installed all UC features except Communicator Mobile and Communicator Group Chat, you can modify the XML file so that those features and topics do not appear in the interface. For material you can put together before, during and after rollout the UC Adoption and Training Kit provides guidance and resources for IT Pros, HelpDesk, and Trainers to speed adoption and usage of Unified Communications technologies in the enterprise. The kit includes Planning Checklists, Awareness materials, including Poster, Door Hangers, and E-mail samples, and User Education Materials such as Quick Reference Cards, Flash Cards, and links to Web-based Training. On the Office online website there is a selection of links that provide a variety of Communicator 2007 R2 resources that can be used for end-user training and adoption, including online demos, Quick Reference Cards, Getting Started and Troubleshooting Guides, help articles, product tours, and online tutorials.